The gryphon (or griffin) was another hybrid creature from Greek mythology. With the head, wings, and legs of an eagle, and the hindquarters of a lion, the gryphon represented speed and majesty. 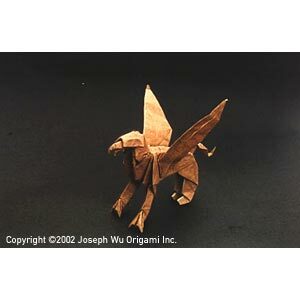 From an origami point of view, the chimaera, gryphon, and manticore are closely related, all being folded from the blintzed frog base.